8)	The Indian Food Express is well known for a variety of reasons. One of the primary reasons being that you can source the choicest of South Indian recipes from here. The Indian Food Express is well known for a variety of reasons. One of the primary reasons being that you can source the choicest of South Indian recipes from here. The recipes are enlisted in a convenient manner encouraging newbies to step in the kitchen and try out cooking. I have also shot an interesting array of videos giving insight on South Indian cooking in Tamil. The Indian Food Express also goes places, reviewing restaurants and events. I have been given an opportunity not only to review restaurants and eateries in Mumbai, but I have also reviewed restaurants in Chennai, and gone International as well. Most recently I have been named as one of the only food bloggers to be invited at the Lakme India Fashion Week, to review the spreads there. I particularly take pride in partaking in any charitable event hosted by renowned hotel or restaurant chains. I recently partook in an event such as this that was hosted by the Radisson group. The chain had taken the initiative to host a brunch for all the senior citizens at the Jeevan Asha Old age home in Andheri (Mumbai). 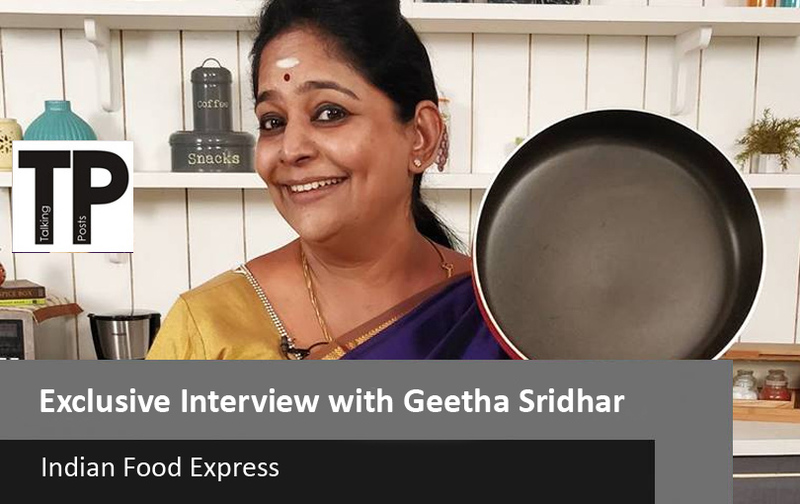 I, Geeta Shridhar, was born and brought up in Chennai. I moved to Mumbai upon my marriage. I spent the early years of my marriage caring for my father who was bed-ridden owing to cancer. His cancer was growing fast, something changed upon his death and I devoted myself to charitable activities. Some of these also included providing food to the cancer patients at the Tata Memorial Hospital. My love for cooking was noticed my all my kith and kin, and this encouraged me to participate in the famed cooking show, Masterchef (India). I did pretty well on the show, and later my children encouraged me to write blogs comprising of the numerous recipes that I used on the show. Who is the encouragement behind? I credit my daughters to help me discover my joy for writing. After completing my stint with the reality cooking show Masterchef India, My daughter asked me to key down the recipes on Blogspot. The number of viewers grew with every passing month, and I was overwhelmed with the received responses. I gradually started my own website, and stared keying everything there. Freebies that I received from numerous companies were put to good use, and it helped me expand my vision and work with charitable causes. I am able to provide a lot more to the needy with the help of this blog. In fact the blog has given me the impetus to grow in more than ways. I am in my fifties and discovered joy in blogging very late. What I have come to realize is that the competition here, especially with food blogging is very stiff indeed! In the recent months I have noticed that the younger entrants almost treat me like a victim who is sabotaging their opportunities. I would never do that in all fairness, as I blog out of passion. It pains me to see, that bloggers who befriended me at the brink of my blogging career and now turning their faces from me. People don’t even have the decency to say a courteous hello, when they see me. I have also encountered with people who have cheated me and even tried to strip me off my opportunities at the cost of my name. But not all is bad, I am now beginning to looking into the future that is bright and where I can implement my plans entailing growth and success. How could your startup change the society? My initiative will encourage the youth to cook. I also give insight on newer cuisines enlightening people about food. I take part in charitable actives, which should also encourage the youth to do so. This in turn will help better our society. What are your future plans about your startup? I hope to expand in the next three years, and hope to appont a team as well. I have a small dream to go international, and take The Indian Food Express places.